Mülheim, November 7, 2018 – As the world's first supplier of this new product, Turck now has a safety disconnection box with IP65 protection in its portfolio that reliably disconnects load currents up to 9 A in the field and is TÜV-certified. The TBSB Box expands the safety offer of the Mülheim automation specialists and supports the trend towards cabinet-free machine installation through the use of decentralized safety solutions. Currents up to 2 A can be switched with Turck's TBPN/TBIP safety hybrid module, which combines four safety and four standard I/Os in a single IP67 block module. 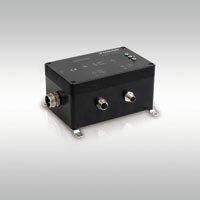 For higher load currents up to 9 A, the TBSB Safety Box is simply connected to the Turck hybrid module or to safety modules of other manufacturers. The robust design in the die-cast aluminum housing and the wide operating temperature range from -25 to +50 °C enable durable use of the modules in harsh industrial environments.